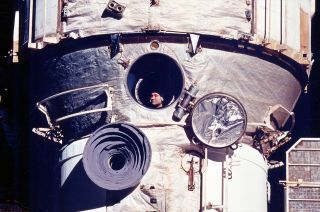 Cosmonaut Valery Polyakov looks out the Russian space station Mir's window during his record-setting 438-day mission from 1994 to 1995. An American astronaut and Russian cosmonaut are set to make history as the first crewmembers to spend a year onboard the International Space Station, but the two are not the first to log 12 months off the planet. NASA astronaut Scott Kelly and cosmonaut Mikhail Kornienko will lift off to the space station on Friday (March 27) to begin the yearlong expedition. Joining them on Russia's Soyuz TMA-16M spacecraft for the 6-hour trip to the orbiting outpost is cosmonaut Gennady Padalka, who will stay on the station for the more usual six months. NASA astronaut Mark Kelly and Russian cosmonaut Mikhail Kornienko are taking the ultimate space trip: one year in space on the International Space Station. See how their epic yearlong space station mission works in this infographic. Twenty-two other cosmonauts and four NASA astronauts have to date accumulated 365 days or more over the course of two or more space missions. Kelly and Kornienko have each already logged about 180 days in space; Kelly on three previous missions and Kornienko on one 6-month stay aboard the space station. Kelly will become the first American to spend 12 consecutive months in space, setting a new American record for time in space. He will surpass both astronaut Michael Lopez-Alegria's 215 days on a single mission, set in 2007, and astronaut Mike Fincke's cumulative 382 days, which he accrued over three spaceflights. There will be no similar records for Kornienko, though. He is now the fifth Russian cosmonaut to embark on a one-year mission. The first humans to complete a trip around the sun — while off the Earth — were Vladimir Titov and Musa Manarov, who as crewmembers on Russia's former Mir space station from December 1987 to December 1988, tallied a total of 365 days, 22 hours and 38 minutes orbiting the Earth. Their record was broken eight years later by a former crewmate, Valery Polyakov. Living aboard Mir from January 1994 until March 1995, Polyakov set a record that still stands today for the single longest space mission: 438 days. Unlike Titov, Manarov and Polyakov — and for that matter, Kelly and Kornienko, who knew they were embarking on a yearlong mission before they launched — the most recent cosmonaut to log 12 consecutive months in space learned the full duration of his mission only after he was already living aboard the space station Mir. "I was prepared that my flight might turn out to be a little bit longer, but I never thought it would be twice as long," Sergei Avdeyev told a NASA interviewer. Avdeyev ended up spending 380 days in orbit as a result of a change in the length of another crewmember's stay. The goal of Kelly's and Kornienko's mission, which is set to last 342 days, is to build on the experiences of Titov, Manarov, Polyakov and Avdeyev while they collect the data needed to support even longer missions to deep space, such as sending astronauts to Mars. "The last long-term space mission ... brought major data for investigations and research about how humans will feel during long-duration flights into space," Kornienko said. "I hope our mission [provides] an opportunity for others who will follow in our footsteps." Key to that will be the tools now available onboard the International Space Station to record his and Kelly's experience. "Technology has developed significantly since the Russians had the last crewmembers spend that amount of time in space," Kelly said in a NASA preflight interview. "The types of imaging capability, between MRIs and CAT scans, ultrasound and probably all ways that we collect data, it has gotten better since this was done the last time." "I suspect we're going to learn a lot about our physiology and how longer-duration space flights affects it, and hopefully ways to mitigate those effects," Kelly said. Robert Z. Pearlman is a Space.com contributing writer and the editor of collectSPACE.com, a Space.com partner site and the leading space history-focused news publication. Follow collectSPACE.com on Facebook and on Twitter at @collectSPACE. Follow us @Spacedotcom, Facebook or Google+. Originally published on Space.com.